The Taylor GS Mini Acoustic Guitar may be small of stature, but this scaled down version of the Taylor full-sized GS packs a punch when it comes to sound and sustain. With a solid Sitka spruce top and a sapele laminate back and sides, this portable package plays like a dream and produces a surprisingly loud volume for such a small guitar, not a surprise seeing as Taylor makes some of the best acoustic guitars available. Too hard of picking or strumming can give it a “boxy” sound, but for fingerstyle play and light picking and strumming, this little number gives out a big sound that can easily be mistaken for a full-sized guitar. Its ease of play is especially good for younger or more slightly built players but can prove a bit “tight” for taller or larger built players. However, it makes up for this by being light enough to travel easily and sturdy enough to be in good shape when it gets to where it’s going. Of course you’ll want to make good use out of the hard gig bag that is included in the $499 price tag, but you’ll find that this little number lends itself well to use everywhere from campouts to jam sessions. 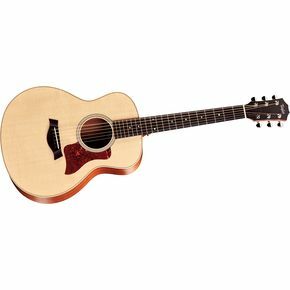 See more great guitar reviews at Taylor Acoustic Guitars. Join in and write your own page! It's easy to do. How? Simply click here to return to Taylor Acoustic Guitars.